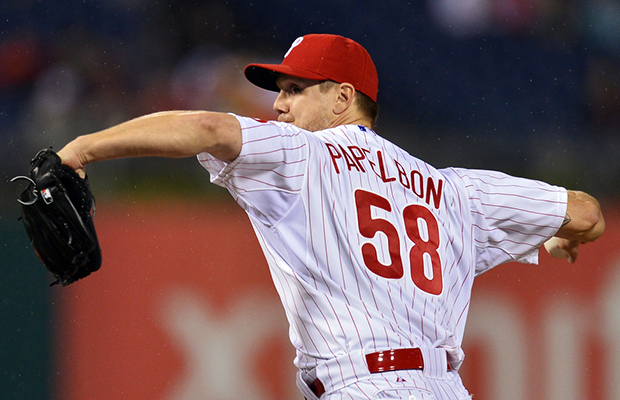 PHILADELPHIA — The Phillies are still talking to the Brewers and Blue Jays about a Jonathan Papelbon trade. Two sources said on Tuesday evening that the talks are alive, although the seriousness of those discussions is unclear. Yahoo! Sports first reported Friday that the Phils and Brewers were in serious negotiations. FOXSports.com mentioned the Blue Jays’ interest. In the days since, reports surfaced that a deal with either team is unlikely. But that has not stopped them from continuing to talk about Papelbon. Both Milwaukee and Toronto need a closer, and Papelbon would fill that void, but there are serious sticking points. The time has come to break up the Phillies. As I wrote a few weeks ago Ruben Amaro Jr has a phone and he will willing to answer it anytime someone wants to talk trades. The Phillies are an aging team that has one foot still firmly planted in the past and the other that can’t step into the future until it sheds that past. Armoro gambled when he didn’t react when Ryan Howard tore his achilles a few years ago. His choice then was hold it together and wait for the offense punch to get back on his feet. At the time of his injury he was one the scariest hitters in baseball who had just signed a mega deal that would keep the Phillies rolling for years. They had a filthy staff that could win an series and with Howard. Jimmy Rollins, Chase Utley, Shane Victorino, and Carlos Ruiz. In 2001 they scored 713 times and gave up only 529 runs, last season they scored only 619 runs and gave up 687 runs. That is almost 200 runs and that is a big reason why the Phillies went from winning the National League East with a record that was 42 games above .500 to won that was a last pace finisher with a 73-89 record. Amaro tried to keep the band together as long as he could but the hits just are coming anymore. The Phillies window has closed for now. Is there a reason why the Phillies should hang on to Papelbon, the answer is no. The Phillies will not be a favorite to win the NL East this season. He makes $13 million a year and is under control for two seasons if he hits his vesting option, which he will if he is pitching on a winner. He had 39 saves with 4 blown saves last year on a last place team. His 2.8 WAR is best among the top 10 ten closers in terms of saves and his .90 WHIP is tops on that list as well. His price tag is in the neighborhood of Joe Nathan‘s $10 million dollar salary this season and the $13 million will make the last two years of his current deal. So who needs him, lets start with the Oakland A’s, they will have a question mark at the back end of their bullpen with Sean Dolittle having some arm issues. Last season Oakland had 21 blown saves. The Tigers have been shaky in their bullpen for years, they have Nathan, but a one two punch with he and Papelbon will truly shorten a game and make that rotation even better. Would the Giants take on his cash, do they have a closer they can rely on right now to finish for them. Santiago Casilla picked up the slack for Sergio Romo, but can he repeat the success he had last year? Toronto wants to make a run the AL east, but they need to do better than 18 blown saves this season. The Brewers can use a closer they can depend on and I don’t think they have it on the roster right now. This might be crazy, but Mariner fans might be better off blood pressure wise if they could bring in Papelbon instead of the tightrope walking Fernando Rodney and his high wire act that has them biting their nails all day long. Bottom line is if you need a closer call Amaro, he needs to move players and is asking a lot in return, but if you need a lights out closer he has one and you need one, make him a deal he can’t refuse.